Behind the scenes of an artist’s work are shippers, framers, restorers and conservators essential to an artist. 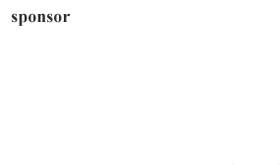 Cincinnati has several people working in those fields. For this article, we talked with many people who perform such necessary tasks. 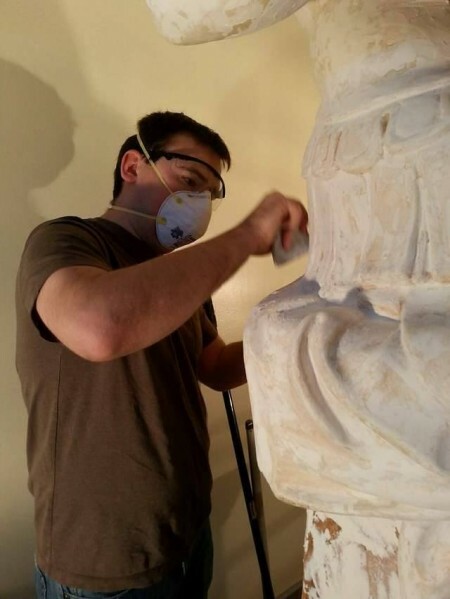 When he founded Old World Restorations, Inc. in 1978, there were few options for professional conservation and restoration of art in and around Cincinnati. “I recall hearing numerous collectors say that one had to go to New York to find a competent and experienced art restorer or conservator,” he said. 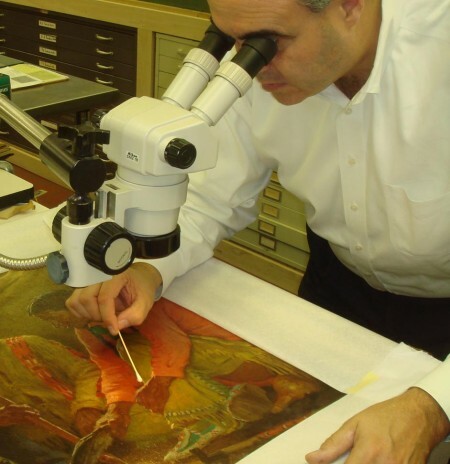 His particular interest lies with conservation treatment of damaged and deteriorated paintings. “I have always had as much interest in the structure and support of a painting, as I do the artistic elements of the work,” he said. Eisele said art is a personal thing. “I enjoy and appreciate that our clients trust us with family keepsakes. We are honored by their confidence to protect, restore and preserve their treasures. I also enjoy experiencing both the physical transformation that takes place during the restoration process as well as the often emotional reaction of a client who is pleased with the result of our efforts,” said Eisele. He notes that the business has changed a great deal over the past forty years, as has the type of art that the company restores and preserves the most. He continues to develop his craft through research and development of the most advanced materials and techniques available. His company focuses more on the treatment of two-dimensional art, such as paintings and works on paper, rather than ceramics and glass. His staff also educates clients on the proper care, display, handling and storage of fragile, art, antiques and other collectibles. Although Eisele and his staff have restored thousands of works over the years, many presented significant challenges to reverse old repairs and to restore and preserve them without causing additional harm. “These works are often created using substandard materials that were only expected to survive the sixth-grade school art fair,” said Eisele. His company’s employees have restored works on display at such places as the Columbus Metropolitan Library, Lincoln Grant School in Covington, Kentucky, Louisville Water Works, and Mother of God Church in Covington. Cross the Ohio River and find another company that offers a different service to artists. Safe Ship, a national chain with a location in Newport, has a box maker. Co-founder Kathy McNay said that the store, which opened in 2011, provides walk-in shipping in addition to work with auctions, art and antiques. Elliott Heil now owns the store. McNay talks about the uniqueness of her company. Small by design, it offers a one-on- one customer experience. The store’s employees handle packing and shipping of paintings, antiques and high-end art. Some unusual shippings have included two pieces belonging to Czar Nicholas II sent to a museum in St. Petersburg, Russia. In addition, the store shipped an Alexander Calder sculpture to Christie’s Auction House in New York for a sale. Nathaniel Westcott, a native of Norwich, New York, began framing at Loveland High School and studied the profession at the University of Cincinnati. He worked full-time as a scenic artist for Cincinnati Playhouse in the Park. When layoffs occurred, Westcott took a position with Michael’s until the store’s owners called asking him to work part-time for their firm. He rose through the ranks to become an art owner in the last nine years. One of the most unusual frames the store has done is the one made for The Quarter Bistro Restaurant in Mariemont. Challenges the store face are similar to all small, local businesses. For example, Westcott cites having enough work flowing through the shop, making sure he has knowledgeable staff to help customers, and struggling to find appropriate work. Westcott’s client base consists of private individuals for whom the store frames personal artwork for their homes. Clients come from Indian Hill as well as Price Hill, Mason and Florence. In addition to individuals, the firm works with clients in their offices, with institutions like UBS, Procter & Gamble and Cincinnati Children’s Hospital Medical Center. Westcott celebrated 2016 as his first year as sole owner of the business. While it was a productive year, he anticipates paying off loans in 2017 and looking forward to what his mark on the city will be. On his agenda are increased staffing and widening the base of services. “But, it’s important for people seeking framing, especially for the first time, to really examine the market and look carefully at the options. It’s worth meeting with a few different framers. Try to find someone who really gets your style and understands what you are trying to accomplish,” said Westcott. “I’ve always said that framing is a lot like hair styling: you find someone you can work well with and you hold onto that relationship forever,” he added. Another store contributing to the arts in Cincinnati is the Collector’s Art Group located at 225 E. Sixth Street. Terry A. Doyle along with his brother Tim and Ballard Borich opened CAG in 1993. They handled all framing clients, did frame design, building and finishing. Terry did the conservation work. Ballard has since retired, and Tim moved to a more challenging career in display design and manufacturing. 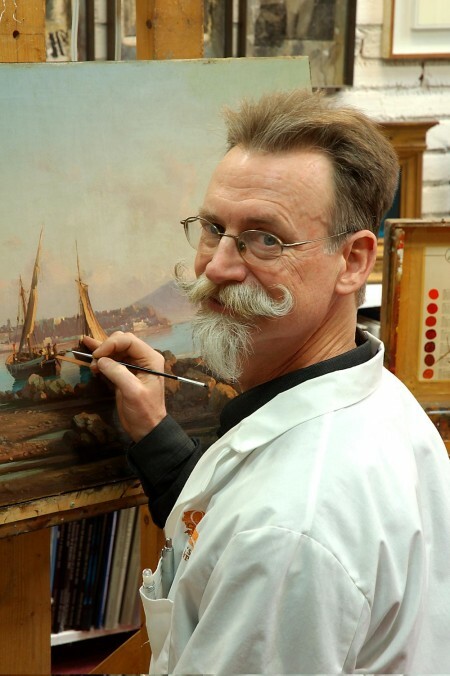 “When I decided that I would most likely not be able to support myself in Cincinnati doing the kind of paintings I liked, and in order to stay close to paint and painters and collectors of paintings, I began to learn about presentation of paintings (framing) and preservation of paintings (conservation and restoration),” said Boyle. After a stint as frame shop frame man and art conservator at A. B. Closson Co., the opportunity to restore clients’ paintings presented itself at Cincinnati Art Galleries before opening Collector’s Art Group. Boyle said he hopes CAG is different from other stores in the enthusiasm for the work. “I have done conservation now for over 30 years. The thing that still excites me is that I am in the unique position of having hours, days, sometimes weeks, to spend in front of a particular painting, getting to know every brush stroke as I roll my Q-tips around them to remove the years of accumulated dirt and yellowed varnish. I suspect that often I spend more time looking at a painting than the artist did. I like that,” Boyle said. Another Cincinnati standard in the conservation and restoration field is Wiebold Studio founded in 1945 by Charles Wiebold. He started the business out of the family home on Cambridge Ave. in Terrace Park. Leadership of the business passed down to his son Bill and now Bill’s son Andrew, who is Running the store with Jerry Litmer, a long-time employee, now general manager and chief paintings conservator. “Every day on the job you see something you’ve never seen before,” said Litmer, who celebrated his 50-year anniversary with Wiebold Studio in 2016. The studio offers major services such as conservation, restoration and repair of artwork and collectibles. The shop works on approximately 1,200 pieces annually with eleven employees sharing the load. Business Manager Jennifer Burt said the firm provides clients advice, service and restoration that will allow them to keep an item as long as possible. Burt joined the company as an apprentice metalsmith in 2005. Daily, Burt said, “Wiebold’s meets people interested in protecting and preserving their past for the future. We find that as companies push to mass produce and create a more disposable society, our clients grasp on to items that have transcended generations,” she said. Clients include art dealers, museums and collectors. A small crew of artists and conservators work on a broad range of projects including painting and frames, porcelain and ceramics, sterling and metal ware – and Litmer’s specialty – portrait miniatures. Under Litmer’s direction, several Cincinnati landmarks have experienced a partial rejuvenation. These include Old St. Mary’s Church in Over-the- Rhine, Our Lady of the Holy Spirit Center in Norwood and the Cathedral Basilica of the Assumption in Covington, Kentucky. Of special note is 70 hours of restoration work that Wiebold Studio donated for several pieces at the National Cathedral Washington, D.C.